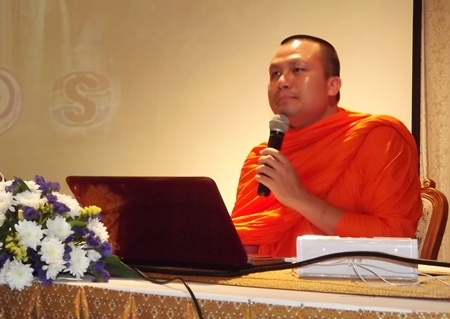 A Bangkok monk encouraged Buddhists to consider mankind’s merits and sins through ‘four sublime states of mind” during the Diana’s Group’s latest “Dharma in Time” broadcast. Pra Maha Sompong Talputto of Phrasoi Thongbangsue Temple in Bangkok spoke to youths and hotel group employees on “Phromwihan” during the Nov. 15 taping of the cable-television show at the Diana Garden Resort. It airs quarterly on the Sophon and Banglamung cable networks. 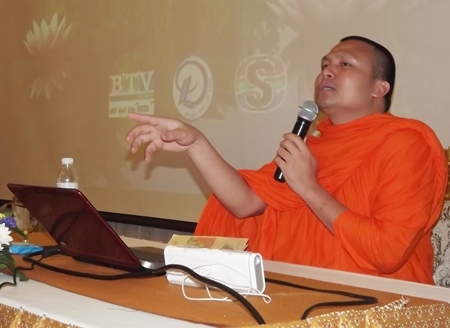 Pra Maha Sompong Talputto preaches to youths and Diana Group employees during the taping of the “Dharma in Time” cable-television show at the Diana Garden Resort. Sompong preached about family, the heart of dharma, by insisting audience members take into account the merit and sins that mankind has perpetrated by using the sublime states, which include loving kindness, compassion, sympathetic joy and equanimity. Doing so, he said, inhibits and instills sense leading to development of creativity, self-development, and the ability to turn bad experiences into life lessons. The provost had also added mottos, wise words and blessed the attendees, stating that for some, life is extremely tough. Therefore, if one wants to commit any action, one must have the sense, a good heart without expecting benefits or consequences. He added that in today’s era, children can even teach adults dharma because human growth is not equal, it depends on our thirst of curiosity to learn dharma by Lord Buddha to use in the correct method.